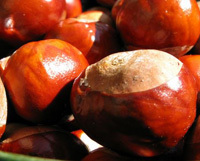 There is a very small minority of schools which no longer allow children to play conkers. This is not a response to any directive, but more a well-meaning concern for safety which could be specific to the school’s available resources to supervise children at breaktime when games such as conkers are played. But far more schools allow children to play conkers, and many encourage the game. This headteacher in Cambridgeshire holds lessons for children at his primary school on how to play a game of conkers. Also, the Health and Safety Executive says the risk from playing conkers is so low that it’s “just not worth bothering about.” If kids deliberately hit each other over the head with conkers, that's a discipline issue. It is terrible to think that a doctor, at any time, would not help someone who needed medical attention because of a fear of being sued. Most doctors are fully aware of the law and understand that only proven negligence can result in a successful personal injury claim. This view that Good Samaritans are putting their own necks on the line was so strong that the Government introduced a Bill last year to put fears at rest and exempt ‘helpful heroes’ from the law - even though they were never under threat in the first place. Judges have long considered an intervening person’s good intentions when such cases arise. This one isn’t really a myth, although the final settlement figure has never been revealed. The reason this case is included here is because it had a significant impact on the public’s perception of personal injury, and many people’s perceptions are based on misunderstanding or missing facts. Many people who can remember the early 1990s will have been aware of this case, if not its facts. The case of 79-year-old Stella Liebeck who successfully sued McDonalds after she accidently spilt a cup of their coffee on her lap and suffered severe burns in 1992 is notorious. Many news outlets overlooked the critical facts of the case including the 700 other complaints that McDonalds had received to say that the coffee being served was dangerously hot. Liebeck v. McDonald's Restaurants was held up as an example of an increasingly litigious society, due to many misconceptions surrounding it. 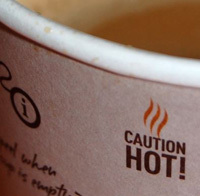 The 2011 HBO documentary Hot Coffee revealed how many people thought Mrs Liebeck was driving when the incident occurred (she was a passenger in her grandson’s car) and thought that she suffered only minor superficial burns. Mrs Liebeck suffered permanent disfigurement and was partially disabled for two years after the incident. A vascular surgeon determined that Mrs Liebeck suffered third-degree burns over six per cent of her body, including her inner thighs, perineum, buttocks, and genital and groin areas. She initially sought to settle her claim for $20,000, but McDonalds refused. A jury awarded Mrs Liebeck $2.7m in punitive damages, which exist in the US to ‘punish’ the wrongdoer. Punitive damages are not available under English law. This figure was reduced by a judge to $480k even though he said he found McDonalds' conduct to be ‘reckless, callous, and wilful’. The case was eventually settled in secret, for an undisclosed sum. As with any personal injury claim, someone must be negligent and that negligence must be proven for a claim to succeed. That means the person being sued did not take, or could not be bothered to take proper care or has been reckless. We are not aware of a claim of this kind being brought, and if there was, the homeowner would have to have been extremely reckless for a lawyer even to consider taking it on. 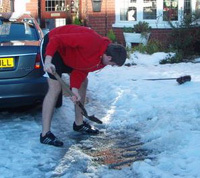 For example, using hot water to melt snow which is then going to re-freeze and create a dangerous sheet of ice would be foolish and negligent. The standard, and common sense, recommendation is to use some grit and a shovel. If someone falls over it’s their own fault, they should look where they are going. There are countless stories which evoke the reaction from those who hear or read it that “it’s their own fault”. An example of this includes Brian Piccolo who sued a florist for £1.5m after he slipped on flower petals in front of the shop at Marylebone train station in London. In evidence it emerged that there had been repeated complaints by the railway station that there was a risk of injury to the public because of water spillage and fallen petals from flower displays. The court found that there was no safe and proper system in place to remove obvious hazards from the flower shop on the train station concourse and the occupier was in breach of her duty of care. The resulting injuries went far beyond most people’s experiences of slipping over. Mr Piccollo was hospitalised for six months with temporary paralysis and then needed assistance in walking. The 44-year-old said at the time of the trial: “'I was walking along minding my own business and through no fault of my own I have ended up like this. My life has been turned upside down. I can't do the things that I want to do”. Headlines provide little room for anything beyond a first impression. As with the Liebeck vs McDonalds Restaurants case, only when the facts are known does it become clear that an innocent person has been harmed by another’s negligence and deserves redress to help put their life back on track.